He claimed that "from the moment that he wakes up, he starts charging his credit car," he wears brand name clothes, he uses up a stack of 100 RMB bills to light his cigarette ... recently, a Shanghai blogger who writes about his life of luxury using illustrative photographs even as he makes no disguise about his contempt for poor people. On the morning of October 23, our reporter entered the blog of "Young Dragon Master" (小龙少爷) and found out the blogger is twenty-three years old, lives in Shanghai and loves to eat, drink, drive fast cars, buy brand name products, etc. The "Young Dragon Master" began to write his blog in September 2005. Basically, he is describing his daily extravagant consumption, listing the detailed brands, prices along with phootographs. The "Young Dragon Master" describes himself as the future husband of the YSL Greater China business representative, he earns 300,000 RMB per money, "he earns his own money and supports his entire extended family," "I wake up in the morning and I began to charge credit cards ... I just charged HK$145,870 off my mother." 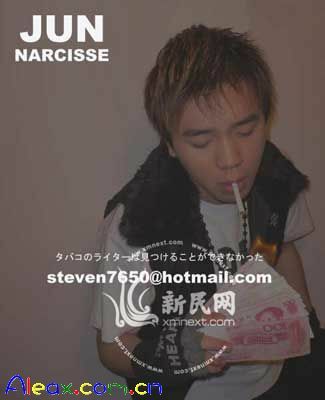 About his conspicuous consumption, he wrote: On June 25, his blog post was about he and his "wife" were driving in a Porsche open-top sports car around the Victoria Harbor front "even though it was very hot. The wife said that she must always ride with an open-top. I said when I drove in Shanghai, I don't use air-conditioning and I roll down the windows. 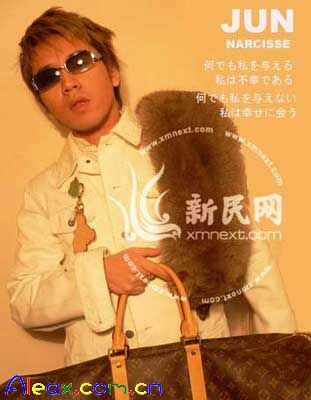 This is to demonstrate my wealth ..."
The piles of brand names on "Young Dragon Master" and his narcissistic posturing reminds people of the Internet celebrity "Poison" (毒药). People who have read both of their blogs say that "Young Dragon Master" is inferior to "Poison" in terms of look, style and taste. Although "Poison" is suspected of using photographs to show off his brand name possessions, he has good artistic taste and he pleases people. As for "Young Dragon Master," the people use terms such as "obscene," "nouveau riche" and "loathesome." One netizen said: "When some people wear name brands, it makes me long to buy those brands too. When other people wear the same brands, it disgusts me and makes me want to avoid those brands. It is not that I hate wealthy people, but I am feeling sorry for those elegant and elite brands." On January 26, 2005, "Young Dragon Master" posted a photograph with the title "Little Dragon's Action Art." In the photograph, he used a stack of 100 RMB bills to light a cigarette. According to Mr. Wang from the Bank of China, Shanghai Branch, Currency Sales and Operations Division: "According to the People's Republic of China Bank Regulations, Chapter 3, Article 19 -- it is illegal to forge, alter and buy/sell forced/altered RMB currency. It is prohibited to intentionally destroy RMB notes. It is also prohibited to use RMB notes for the purposes of promotion, publication or other commercial purposes." Mr. Wang said that if the person was burning real RMB notes, then the public security bureau should investigate him for intentionally destroying RMB notes which carries a maximum sentence of not more than seven years. If the person was burning fake RMB notes, then the public security bureau should investigate him for possession of fake RMB notes. When the reporter attempted to re-enter the blog on the afternoon of October 23, it was discovered that the access is now restricted.